so the pictures are less than awesome. The pizza tasted great though. Sometimes a thick crust pizza is in order. When it is, I use this recipe. Although my husband gingerly shared with me this evening that he prefers a more balanced cheese to crust ratio than this thick-crust pizza provides, it is my current favorite. My actual favorite (if you must know) is my Ciabatta Crust Pizza, but since one of my kids is going gluten-free I don't make that one so as not to torture the poor kid. So, I make a separate gluten-free pizza for my son. 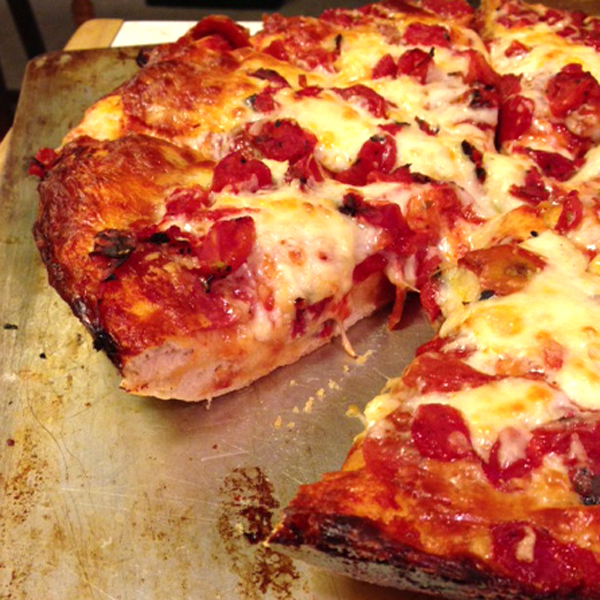 I will post that recipe soon, I hope, and I tonight I made this gluten-full pizza for the rest of us. Besides the yummy bready crust of this pizza, I like the fact that I can make the dough and the pizza in just about an hour and a half. All of my other favorite crusts take 12 to 24 hours of forethought, and I just don't have that kind of thinking time these days. 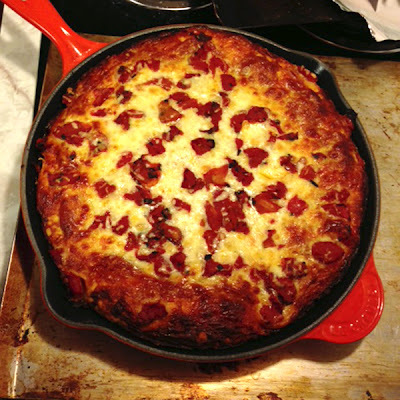 I don't know if you can make this pizza in a different kind of pan or dish because I've only made it in a cast iron skillet. It reminds me of what we get at BJ's Pizza in Southern California. If you want a slightly thinner crust, as my husband does apparently, you can use the recipe for a 10-inch pan and put it in the 12-inch pan. I think I'm going to try that next time I make this. In the meantime, I think I might work on baking up some thin crusts to have in the freezer for quick pizza dinners. In the bowl of a standing mixer, whisk together the flour, salt, and yeast. Put the dough hook attachment onto the mixer. Add the water and 3 tablespoons olive oil to the flour. Turn mixer onto low and mix dough until the liquid is incorporated into the flour. Turn onto medium speed and knead dough for about 8-9 minutes. Turn mixer off, scrape dough off of the hook, and cover the bowl with plastic wrap. Allow to rise until doubled (about 45-60 minutes). Now is a good time to preheat your oven to 425 degrees Fahrenheit. When dough has doubled, turn mixer on again to medium low and kneed dough for another 2-3 minutes. Turn dough out onto a lightly floured surface and allow to rest for about 10 minutes. While dough rests, prepare a 12-inch cast iron skillet by pouring in the remaining 3 tablespoons olive oil and coating the sides and bottom, using your fingers. After dough has rested, use a rolling pin and your hands to shape it into a 12-inch circle. Place dough into prepared pan. Stretch dough, if needed, to cover the bottom of the pan. Your dough is now ready for toppings. Mix the cheeses in a medium sized bowl. Spread sauce over the ENTIRE surface of the dough--all the way to the edge. Evenly place pepperoni slices over the sauce. Evenly sprinkle cheese mixture over the entire surface of the pizza--even the edges (this is why it's important to oil up the sides of the pan). Sprinkle garlic salt all over the top. Evenly spread diced tomatoes all over the top. Bake at 425 degrees Fahrenheit for about 25-30 minutes. This part is tricky, because you want to make sure the dough is done. If the toppings are browning too much before 25 minutes, place a piece of foil on top--don't wrap the foil over it, just place it lightly on top. Once edges are pretty well browned, take pizza out and poke a knife in, lifting up some of the dough and toppings to see that the crust is baked through and bready looking, as opposed to doughy looking. Remove pizza from oven when done. Run a thin, sharp knife around the edge of the pan to make sure it's loose all around. With a strong spatula in one hand, and a thick oven mitt in the other, move pizza to a cutting surface and remove the pizza from the pan by lifting with the spatula and pulling the pan away at the same time. Now, I won't guarantee this will go smoothly, but you have to get the pizza out to cut it. Once the pizza is out of the pan, slice with a pizza cutter. Serve hot, but be careful not to burn your mouth. Prepare dough same as for the 12-inch pan above, but use a 10-inch cast iron skillet instead of the 12-inch. Am I correct in assuming this is gluten free? Sorry about the confusion. I just revised my paragraph to indicate that this one is full of gluten, but I make my gf son a separate gluten free pizza.